I told you I couldn't wait to make some more! On Sunday, Anonymous hosted us for dinner so I made a batch of regular-sized and mini cupcakes and went to town with vanilla icing, food dyes and decorating gel. The "How Do You Feel?" 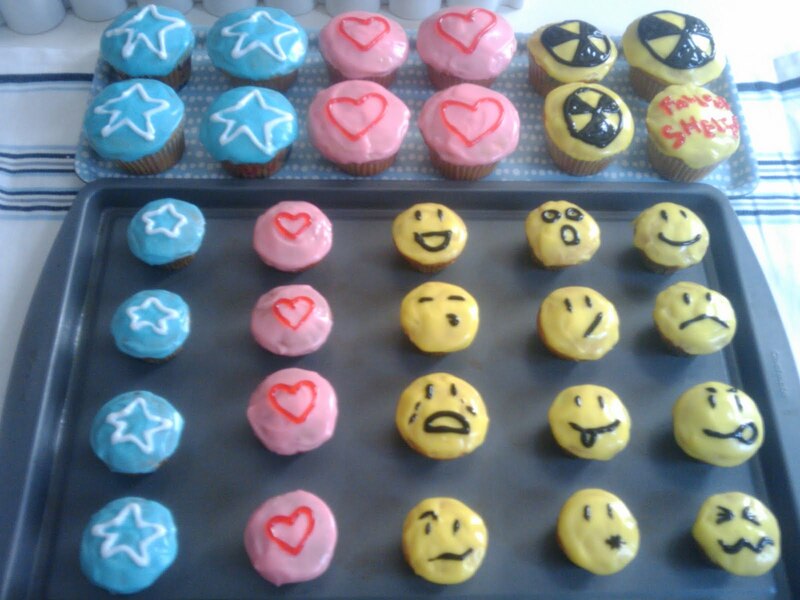 mini smiley faces were probably my favorite to make...and eat. Really? Fallout shelter signs. lol so funny. They look delicious. I want them all.. stat! Those look so good! They just opened a new cupcake shop here. It is on my to do list this weekend. These are so cute! You're making my tummy rumble. I just made some really yummy S'more cupcakes. They're on my blog, if ya want to take a peak. I like the mischievous looking cuppycake, fourth row & third column! "Hmmm... now to invent some glow in the dark, green colored, cream filling for them... "
LMAO!! Totally awesomeness in the comments, iggy! Love the yellow ones... too cute!